Everyone experiences some degree of involuntary motion when trying to keep their hand still. Known as physiological tremor, the underlying mechanisms have been debated for over a century. Two explanations, neural and mechanical, are generally offered. The neural theory suggests that involuntary movements directly reflect oscillations in the control signal sent to arm muscles (McAuley & Marsden, 2000). In the mechanical theory, tremor simply reflects the tendency of the hand to oscillate at its resonant frequency, regardless of the nature of the neural input signal (Vernooij et al, 2014). Distinguishing between these two alternatives has important implications for what we can (and cannot) conclude from observing somebodies tremor. One technique for distinguishing these causes is to alter the mechanical properties of the hand and observe the consequences for tremor. Previous experiments have observed some reduction in tremor frequency by adding mass to the hand, but the results have been ambiguous. This may be because, in addition to increasing its inertia, adding mass also increases the force required to hold the hand against gravity. The additional necessary muscle activity may stiffen the limb, increasing tremor frequency, and this may partially counteract the effect of altered inertia. Therefore, we determined the effect of added force separately from the effect of added inertia. We did this by exposing human subjects to increased gravitational field strength by placing them inside a spinning centrifuge facility. The effects of added gravity were then compared to those of added inertia. 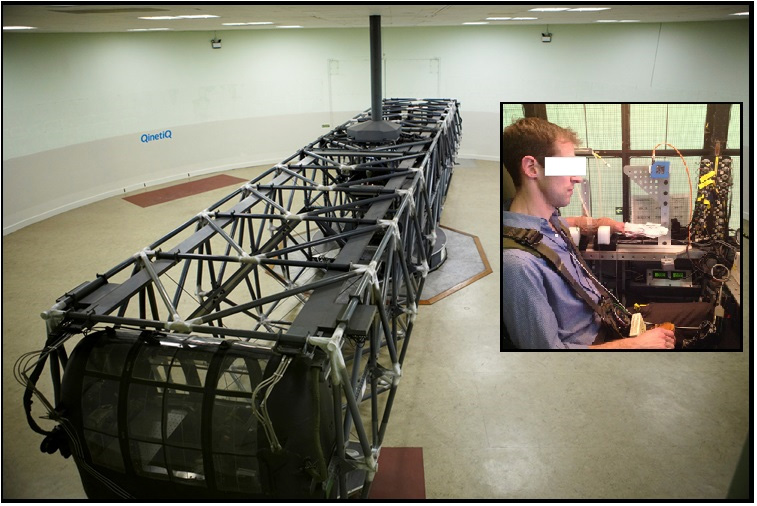 Study subject experiencing increased gravitational field strength inside a spinning centrifuge. Exposing people to added gravitational force in the centrifuge increased their tremor frequency, which we attribute to limb stiffening. Adding mass had the opposite effect, which we attribute to inertial effects. By comparing the effect of gravity versus inertia, we conclude that physiological hand tremor can be explained entirely by the mechanical properties of the limb. In healthy people, physiological tremor provides little insight into the properties of the nervous system, and primarily represents the mechanical properties of the limb. This is different from pathological tremors which are primarily caused by altered neural output. However, even in those situations, mechanical factors will inevitably play a role. Our results also allow us to predict tremor frequency on different planets! Lakie M, Vernooij CA, Osler CJ, Stevenson AT, Scott J, Reynolds RF (2015). Increased gravitational force reveals the mechanical, resonant nature of physiological tremor. J Physiol Jun 24. doi: 10.1113/JP270464. [Epub ahead of print]. McAuley JH & Marsden C D (2000). Physiological and pathological tremors and rhythmic central motor control. Brain 123: 1545-1567. Vernooij CA, Lakie M & Reynolds RF (2015). The complete frequency spectrum of physiological tremor can be recreated by broadband mechanical or electrical drive. J Neurophysiol 113: 647-56. ← Breathing: a constant requirement, but is respiratory muscle activation adaptable?